When making your college dorm checklist, you may be thinking about all the dorm essentials you need for college living but not thinking about the college supplies you need for your college courses. Don't forget about those dorm necessities as they are extremely important to your success in college! Luckily DormCo is your one stop shop for your cheap dorm supplies and we the best dorm bedding as well as the study accessories you need to be comfortable and successful in college. 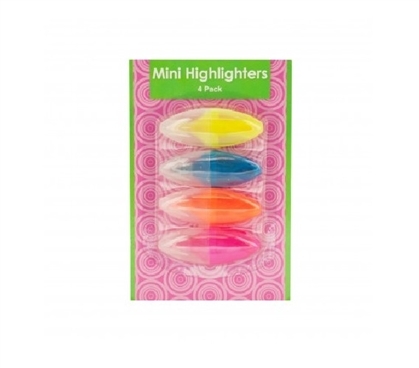 When you're dorm room shopping, don't forget about small dorm items like college highlighters! Our 4 Pack Mini Highlighters are just what you need for your college supplies! Our 4 Pack Mini Highlighters are compact so you can easily stick them into a pocket of your college backpack or purse when you're on your way to class or a cafe to study. This pack of college supplies comes with 4 different colors of dorm highlighters so you can color coordinate your notes. You're going to be taking a lot of notes in your college classes and highlighting a lot of material in your college textbooks. You need to make sure your notes are as organized as your dorm room is. With a set of multi-colored highlighters in your college supplies, you can color coordinate your college textbook notes with the notes in your college notebook for efficient and effective studying.